The Sea Scout Marksmanship Program gives Sea Scout youth an opportunity to learn and be rewarded for their accomplishments. Shooting sports can enhance a ship’s program when on-the-water activities are not possible. To earn this award, Sea Scouts must begin with the Basic Shooter requirements after choosing the discipline or disciplines (rifle, shotgun, or pistol). A Scout may choose to learn how to shoot more than one firearm. 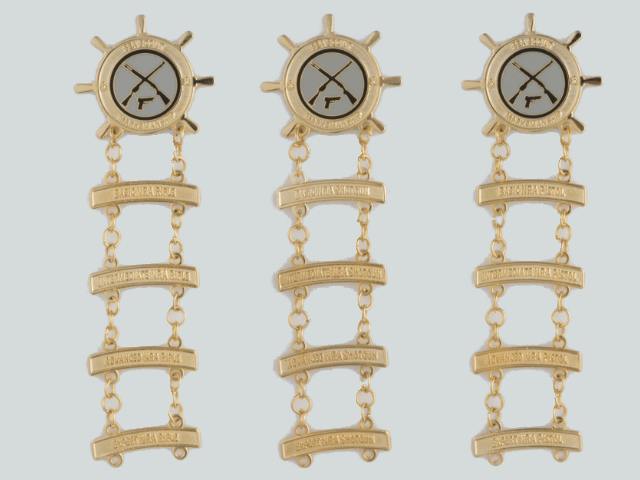 A Sea Scout Shooting Sports Medal is earned after a Sea Scout completes the Basic Shooter level, no matter what discipline they shoot. From the main medal, small metal bars attach that show the Scout’s discipline and level of accomplishment. Sea Scouts only wear that bar for the highest level they have achieved. If a Scout shoots all three disciplines, they will have the maximum number of bars suspended from their medal.